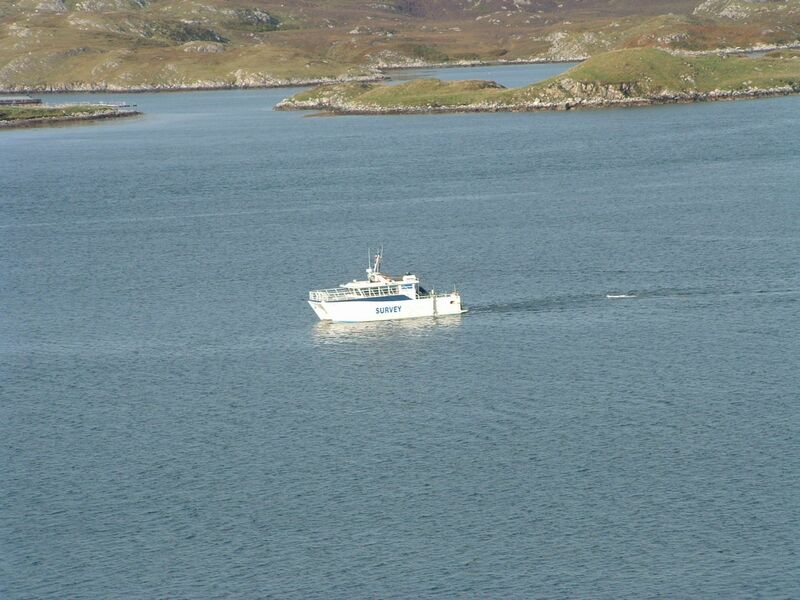 Currently the Western Isles have a small capacity transmission system to cater for the islands supply and demand, linked to the mainland grid via a connection from Harris to Skye. Existing island generation includes small hydro, Arnish Moor Wind Cluster, a diesel power station at Stornoway, a bio-digester and a number of small domestic wind turbines (it is not known whether the latter are grid connected). Should the large windfarms receive consent the construction of a major new transmission system will be necessary. There are currently two grid initiatives being proposed linked to different island developments. The controversial Ullapool - Beauly line (see http://www.hbp.org.uk/) is being proposed to export electricity from the SSE PLC Pairc Windfarm (205MW but 250 MW grid connection agreement) and Beinn Mhor Power Ltd Muaitheabhal Windfarm (currently 159MW although their grid connection agreement is for 300MW). At the moment the anticipated capacity of the new transmission line is 600MW which allows 50MW to service other developments. The proposed preferred route will run from Beauly to Ullapool, then via sub-sea cable to the village of Gravir on Pairc Estate. Here substantial infrastructure will be required. SHETL, part of the SSE group are proposing to run cables up through the small loch around which the village lies, then up accross crofts to a converter station complex which will comprise of a steel clad shed approximately 200m by 100m by 20m high and an external compound of 150m by 150m for transformers and cooling fans. This will be on a comparable scale to the Arnish Fabricaton workshop at Stornoway, which is approximately 140m by 110m. From the Gravir converter station a new connection will be constructed to Stornoway. Currently the preferred proposal is to use two lines of wooden poles which will follow the Pairc main road to the shore of Loch Erisort at Garyvard then split after crossing the loch. One line will join the existing grid lines at Laxay, which runs adjacent to the main road north to Stornoway. The second line will run to Stornoway crossing the Arnish Moor and passing through villages in North Lochs. It is understood that in the event that the subsea cable landfall is located at Stornoway, a High Voltage pylon line could be required for the connections to the Pairc peninsula windfarms. Despite having one of the initial and the largest windfarm proposal, Lewis Wind Power (LWP) do not currently have a grid connection agreement for their 181 turbine development and therefore have no means of exporting their electricity even if they obtain planning consent. LWP are now pursuing a second or alternative cable to the mainland with a number of potential landfalls, including at Hunterston where British Energy, partner in Lewis Wind Power, run a nuclear power station. Hunterston A is currently being decommissioned and Hunterston B (1190 MW) is due to be decommissioned in 2011. On the Pairc Peninsula, although developers have reported that they will seek to underground onsite cabling from individual turbines, it has not yet been clarified how the windfarms will be connected to the Gravir Converter station. The size of the windfarms suggest that pylon lines will again be necessary, unless developers are willing to pay the additional cost of undergrounding, which currently seems unlikely. Pylons will also be a feature of the Lewis Wind Power project, with some sections undergrounded in areas where the risk of bird collission is considered particularly high.